We are halfway through our Share the Love Week spotlighting the incredible Elle's Studio by using their products with w&w goodies and we have so much more to share with you. Today we have some fantastic projects from Julie and Heather and they've brought the cute (just wanted to warn you)! One of my MANY goals this year is to do more scrapbooking and memory keeping and one of my projects is to make my own brag book of my niece Kamilla. That’s Ms. Milla around our house. *hee hee* This page was created to be the title page of my brag book which is in a Basic Grey Capture album. While I was looking through the Elle’s Studio blog, I noticed that they have Sketch Thursdays, and I found this sketch from the April 17 blog post. My page size is a bit smaller than the sketch here, with the dimensions for the background paper cut to 6 3/8 in. x 9 1/2 in. I know! I know! Isn't she the cutest? Ok - I get to brag - I'm the Auntie!!! I used three papers from the 12x12 Everyday Moments collection – aqua solid (which isn't solid, but has a subtle visual texture – yum), the colorful polka dot, and the kraft which I used as a frame for the sleeping baby. These papers made a great foundation for this page, and they are perfect for a baby. I focused on using the yellow and pink/coral colored cardstock from my stash that coordinated with colors from the polka dot, and the yellow complimented the little flower on Kamilla’s hat. 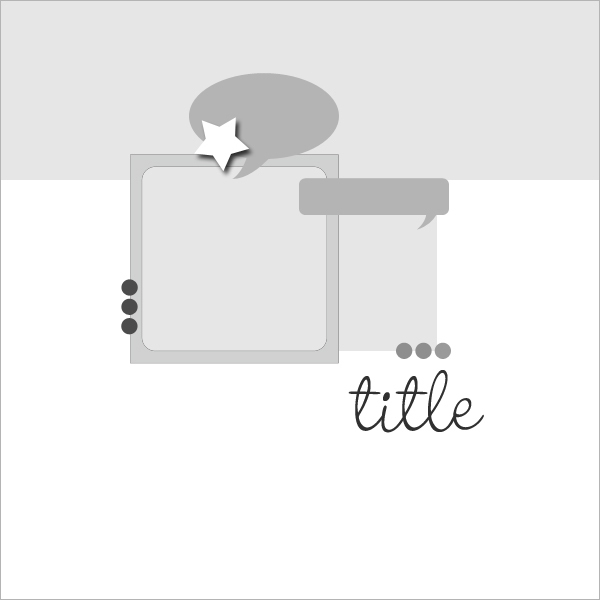 Following the page sketch, I wanted to use a speech bubble and element up at the top, and I also needed an element to the right of the photo so I used .png files that are in our CUT THAT OUT digital die cut sets, and cut them with my Silhouette Cameo. The speech bubble cut file is from The Write Stuff: Leave it to Mom and the ticket and heart cut files are from The Write Stuff: Love Story. Kamilla’s name is also die cut from an image I created in Adobe Illustrator and cut using the Silhouette software Designer Edition. All of the stamped items were created with Versamark ink and Stampin’ Up! Whisper White embossing powder. The You’ve Got Love Mail stamp set is one of my favorites, and the LOVE, XOXO and tiny heart are all in this power house set. It's not just for Valentine's - but for all of those special people in your life. The XOXO pattern was created by stamping only 3 letters, and then offsetting the stamp each time until I filled up the ticket. It is so fun to customize die cuts like that and I really love how the “hello baby” turned out with the little heart– so tiny and sweet! For finishing touches, I was able to dot the "i" in Kamilla’s name with the tiny heart that was cut out of the ticket – don’t you like it when things just work out??? Last, but not least, I added some Candy Buttons from Basic Grey in a near matching yellow and a pink a few shades darker. I've been hoarding these little guys, and thought this was the perfect time to use them. I think my bragging album is off to a great start and the Elle's Studio products were so fun and easy to work with. Feeling inspired? 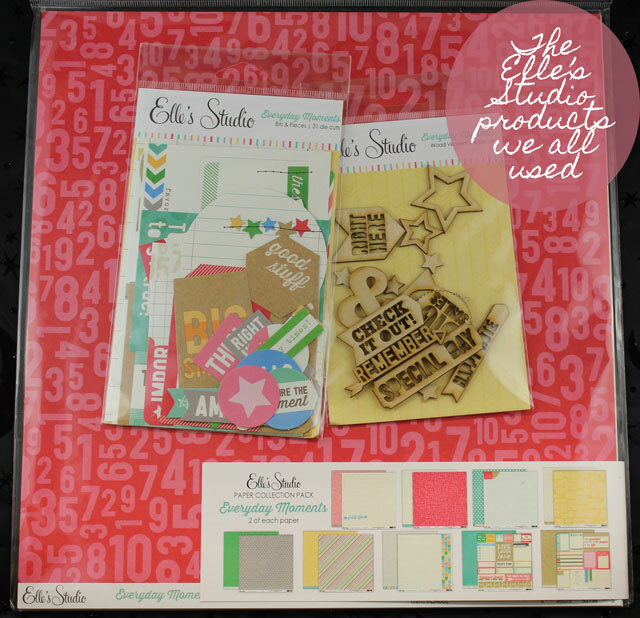 Do you have some Elle's Studio products in your stash and some winnie & walter stamps or digital products at your fingertips? We would love to see what you create using our products and sharing the love with Elle's Studio products! And, if you do have a chance to play along, you can link up your project on the Join in to Win page (check it out for all of the contest rules). Today is the end of the month, and we will be choosing a winner at random from all the comments submitted this month and from the Join in to Win linked projects for the month of April. So, what are you waiting for??? 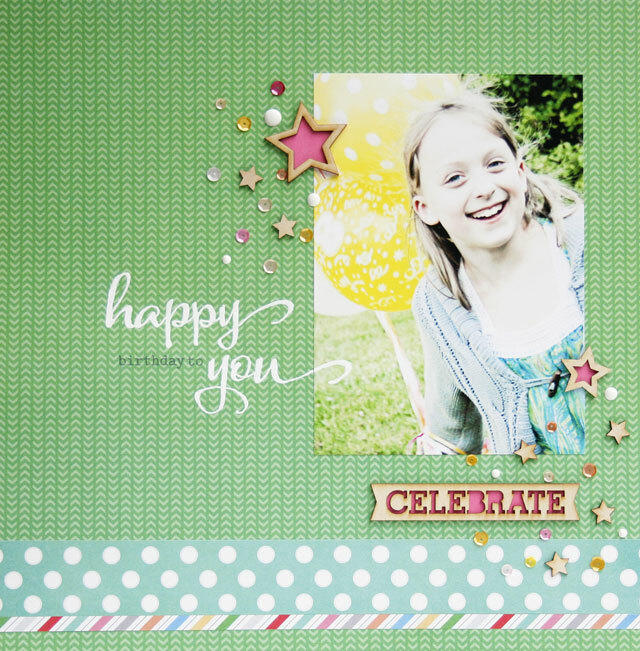 Heather made this completely sweet, colorful and enchanting layout about her super-duper adorable daughter's birthday! Don't miss out on more stupendous Share the Love Week Featuring Elle's Studio projects tomorrow! Lovely layouts. I love the colours in both and the stamping adds life to both. Great job Heather and Julie. Loving seeing stamps on layouts!